實體控制通道（Physical Downlink Control Channel, PDCCH）承载各种各样的控制信息, 自适应的重传需要通过PDCCH进行上行授权. 實體控制格式指示通道（Physical Control Format Indicator Channel, PCFICH）用於通知 PDCCH 的長度. 實體下行共享通道（Physical Downlink Shared Channel, PDSCH）用于承载来自传输信道DSCH的数据. PDSCH 上有支援 QPSK, 16QAM 以及 64QAM. 在 3GPP 第 10 版协议中定义的 8 种 LTE UE 工作类型定义 所取得最大数据速率和MIMO功能的支持. Release 10 Category 6 301.5 Mbits/s 2 or 4 51.0 Mbit/s ? ? Release 10 Category 7 301.5 Mbits/s 2 or 4 102.0 Mbit/s ? ? Release 10 Category 8 2998.6 Mbits/s 8 1497.8 Mbit/s ? ? Release 11 Category 9 452.2 Mbit/s 2 or 4 51.0 Mbit/s ? ? Release 11 Category 10 452.2 Mbit/s 2 or 4 102.0 Mbit/s ? ? Release 12 Category 11 603.0 Mbit/s 2 or 4 51.0 Mbit/s ? ? Release 12 Category 12 603.0 Mbit/s 2 or 4 102.0 Mbit/s ? ? Release 12 Category 13 391.6 Mbit/s 2 or 4 51.0 Mbit/s ? ? Release 12 Category 14 391.6 Mbit/s 2 or 4 102.0 Mbit/s ? ? Release 12 Category 15 3,916.6 Mbit/s 8 1,497.8 Mbit/s ? ? 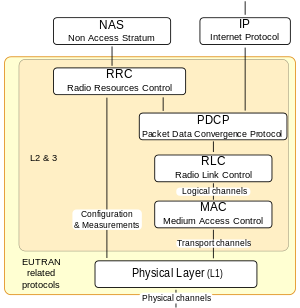 ^ Nomor Research Newsletter: LTE Random Access Channel. [2011-06-14]. （原始内容存档于2011-07-19）.